A disc brake is a type of braking system in automobiles that uses calipers to squeeze pairs of brake pads against the rotor/disc to create friction and reduce the motion of vehicle or to completely stop it. When braking action occurs the kinetic energy is directly converted into heat energy and heat is directly dissipated to the atmosphere. The disc braking system works on the principle of pascal law according to which “ the confined liquid transmits pressure without loss equally in all directions.” In disc brake system energy is transfer from pedal to the brakes. It is also a type of hydraulic brake system as some disc brakes application include the use of hydraulic pressure of brake fluid and some are without the use of hydraulic pressure which are mostly seen on the bicycles and mountain bikes. Brake Disc or rotor: It is the part which rotates along the wheels and is attached to the rim of the wheel. It is squeezed with the help of brake pads to create friction. It is the part which produces a lot of heat. Some rotors which are open are provided holes drilled in it to dissipate heat directly to the environment therby reducing very minor weight of it. Brake pads: They are hard material which squeezes the disc rotor to create friction. They are attached to the pistons which are housed inside the caliper. Brake pads are usually made up of hard rubbers, ceramics, semi metallic materials, etc. Brake fluid(if equipped): The brake fluid is used to create hydraulic pressure which is then used to force the piston outwards towards the disc rotor. They have high boiling point to sustain high temperature, chemically stable and have lubricating properties. Fluid reservoir: A tank or reservoir where the brake fluid is stored. Wheel hub assembly: It is the assembly which holds the wheel and the disc rotor and bearing inside it which provides it for smooth operation. 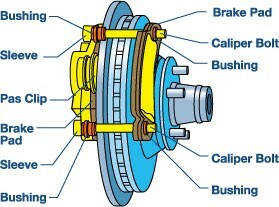 Caliper assembly: It is the assembly which holds the brake pads and pistons. It consists of rubber bellows which protects from dust, inner and outer brake pads, and the main caliper frame and bracket. It has the inner flow line though which the brake fluid flows throughout reaching the piston. They are of two types: fixed calipers(calipers which cannot move) and floating calipers(movable or sliding caliper). Master cylinder assembly: It is the main part of the system. There is a push rod, outlet ports and fluid reserve outside the master cylinder. Inside the master cylinder, there is inlet ports, compensating port, piston seals, primary piston, secondary piston and retaining springs. This portion is near the brake pedal. It might not be present in some small applications. When the brake is applied or brake pedal is pressed the hydraulic pressure is applied to the fluid inlet tube, due to which the hydraulic pressure reaches the cylinder piston inside the calipers. This hydraulic pressure then forces the piston to move outwards the caliper and towards the rotor. Brake pads which are attached to the piston comes into surface contact with the rotor disc and then it causes to create the friction and which reduces the speed of rotation of the wheel. As soon as the brake pedal is released the return springs quickly forces the master cylinder piston to come in its original rest position. The caliper piston also comes in its original position. The surface contact between the brake pad and the rotor disc is now over. The fluid in the inlet lines returns slowly. Higher cc performance bikes as their speed is more there is a need for better stopping power. Also found commuter bikes. Front or all four wheels of new vehicles are equipped with disc brakes. It has higher mechanical advantage. It has better stopping power due to hydraulic pressure and less stopping distance. The heat resistant capability of the disc rotor is more. Also cooling rate is faster due to better heat dissipation. They are heavier as the whole system includes caliper assembly, rotors, brake fluid, master cylinder assembly. They add up more weight. Brake pads replacement are more involved in disc brake. Disc brake offer more stopping power and less stopping distance than drum brake due their mechanical advantages. Disc brakes are self adjusting on its own whereas the drum brakes needs to be adjust over a period of time of run. Also there are some self adjusting drums but with their disadvantage of more complexity , space and weight constraints they are not used. Generally wearing part of the disc braking system is the brake pads, they can be replaced in a couple of minutes but in case of drum brakes, the whole system is integrated inside the drum, and wearing parts are more like brake lining and brake shoes and also due to hard braking over times with less effect and due to thermal expansion the brake drum also wears out and might need to replace whole hub or the rim. Heat dissipation in case of disc brakes is better than that of drum brakes as heat producing parts like rotor are containing drilled holes and also open which maximizes cooling. As the whole mechanism is contained inside a drum, the drum brakes dissipates less heat than disc brakes. Disc brakes doesn’t produce scratching sounds when under contact with water. Drum brakes produces that sound and also become less efficient when in contact with water like in rainy season. Drum brakes collects water inside the drum. Also drum brakes have non-linear characteristics as the braking force is not directly proportional to the force applied. Disc brake have linear characteristics as the flat surface(brake pads) is rubbed against flat surface(disc rotor surface). 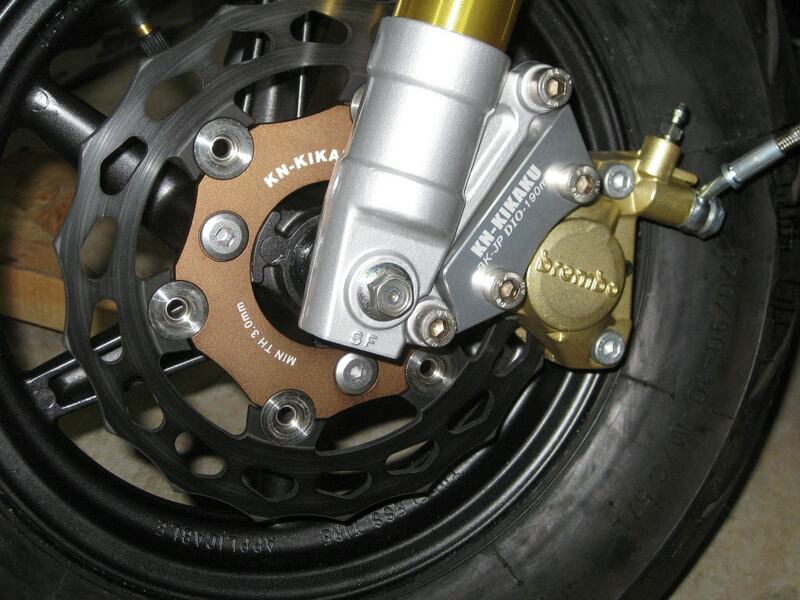 If cost is a factor, then drum brakes are used instead of disc brakes. This is the reason why we see entry level motorcycles (50cc-100cc) are seen with drum brakes on both wheels. They are also offered with front disc brake and rear drum brake to keep the price low.